My motorhome awning mounting holes up at the awning rail are stripped. I don’t know how the roof is constructed behind this rail. Do you recommend just installing larger lag bolts or do you have a better idea. Right now, 1/4" x 3" lag bolts are installed. 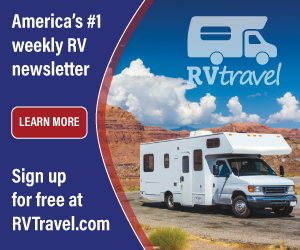 Sal, most motorhomes are reinforced in those areas where awnings are typically installed. A wooden support is usually built into the wall (and near the floor line) to accept the awning mounting screws. If your lags are simply stripped, try removing the upper brackets and plugging the existing holes with a 1/4-inch wooden dowel. Apply some carpenter’s glue to the dowel before you hammer it in. Be sure it fits snug. If it appears loose, wedge some shims in alongside the dowel. Trim off any portion of the dowel that sticks out. After the glue sets, simply reinstall the same lag screws after drilling 1/8-inch pilot holes. Seal the open holes with silicone before installing the awning bracket. If your internal framing consists of aluminum or steel studs instead of wood supports, you may have success simply going to a larger, 5/16” lag screw as you’ve suggested. You’ll have to drill the holes in the mounting assemblies larger to accommodate a larger lag. If the sidewall/roof area is not beefed up or properly supported internally, it may be necessary to “bolt through” the entire sidewall. This can be accomplished by fabricating a 6-inch square aluminum plate with holes drilled to match the spacing of the mounting holes in the upper awning bracket. The plate should be about 3/16-inch thick. Hopefully it will be hidden inside a cabinet. 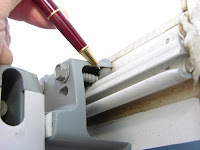 Instead of lag screws, it will be necessary to use 1/4-inch bolts, nuts and washers; long enough to pass through the awning bracket, the sidewall and the interior plate. Not the most aesthetic fix, but effective. Hope this helps!